COSA SIGNIFICA IL PATTO DI PARIGI SUL CLIMA PER I TRASPORTI? The problem of climate change is severe, and we need a large-scale shift in transport — in large cities, in rural areas, all around the world. Many leaders from local and national governments, NGOs and the private sector joined support of sustainable mobility at COP21 in Paris. In fact, never in the history of UN climate summits has there been such a bright spotlight on transport. This is a great, momentous kick-start to promote widespread adoption of sustainable mobility as a strategy to curb climate change. Out of the 200 side events at COP21, more than 40 were dedicated to sustainable, low-carbon transport. It was apparent that key stakeholders recognize the potential of sustainable mobility to help limit warming to below 2 °C. According to UN Secretary General Ban Ki-Moon, sustainable transport is the “common thread” between climate action, sustainable development, and economic and social growth. Taking action now will not only prevent some of the most dangerous impacts of climate change, but a recent study by the New Climate Economy found that significant investment in cities — including in public and low-emissions transport — would bring savings worth $17 trillion. q Transport included in the INDCs: While transport was not explicitly mentioned in the Paris Agreement, more than 61% of countries’ national climate plans, known as Intended Nationally Determined Contributions (INDCs), proposed actions to mitigate emissions from the transport sector. Hopefully more countries will scale up action in the transport sector over time—transport already accounts for 23% of global emissions, and is the fastest-growing sector in the global economy. q Continued support from the Lima-Paris Action Agenda (LPAA): The LPAA brings together state and non-state actors to implement climate action. The Paris Agreement indicated that it will continue to build on the LPAA process by explicitly citing support for the initiative in the adopted text. The LPAA brought greater attention to several sectoral topics –including transport – by hosting focused, thematic events at COP21. It is positive news that the LPAA will continue to build on its successes, especially for the transport sector. q New transport initiatives launched: The LPAA was key to bringing forth the 15 initiatives presented at the Paris Process on Mobility and Climate (PPMC) platform’s Transport Day. 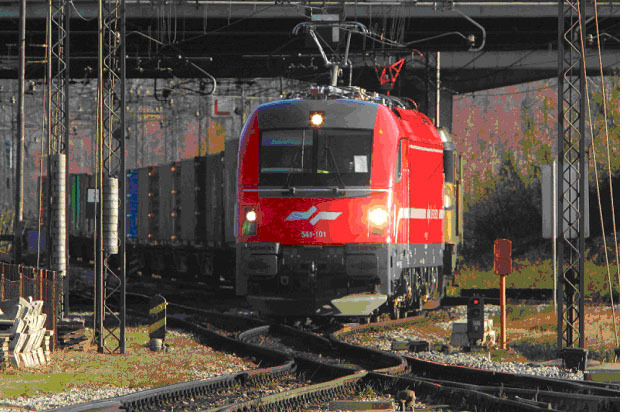 The UIC, the International Union for railways, launched the “Railway Climate Responsibility Pledge” signed by 66 railway companies and promoted the "Train to Paris" initiative. The International Association of Public Transport (UITP), for example, committed to provide support to “double the market share of public transport by 2025”. COP21 also saw the launch of the MobiliseYourCity initiative, which aims reduce emissions in developing countries through urban mobility planning. These initiatives are just three examples of the 15 new programs that, if implemented at scale, could reduce the carbon footprint of all passenger and freight trips by nearly half by 2025. Now is the time for governments and the private sector to scale up these transport initiatives and collaborative efforts in order to meet the ambitious 1.5 °C target set in the Paris Agreement. q Climate Action 2016: UN Secretary-General Ban Ki Moon announced that a broad group of organizations would form partnerships in 2016 to maintain momentum for climate action. A summit for the partners from governments, private sector, academia and civil society will be held on May 5-6, 2016 in Washington, D.C. Transport has been selected as a high-value area for this conference, and will bring more opportunities to convert sustainable mobility ideas into actionable, concrete deliverables. q UN Secretary General’s High-Level Advisory Group on Sustainable Transport Report: On December 7, 2015, the UNSG’s High-Level Advisory Group on Sustainable Transport met and emphasized the importance of addressing climate change through sustainable transport solutions. In 2016, the Group plans on launching the “Global Transport Outlook Report,” which will provide analysis and recommendations to support sustainable transport policymaking. q UN Habitat’s Habitat III: The UN Conference on Housing and Sustainable Urban Development conference, known as Habitat III, offers a chance to carry the momentum from COP21 forward. At Habitat III, leaders will discuss creating a “new urban agenda.” Look for lasting sustainable transport solutions to be laid out in concrete, ambitious language. In order to prepare for these milestones, it is important for leaders from national and local governments to join ongoing, collaborative efforts like the Compact of Mayors and the Cities Climate Finance Leadership Alliance, which also provide connections to key stakeholders at NGOs and in the private sector. By forging these partnerships, national governments can receive additional support for planning and implementation of commitments made at COP21. 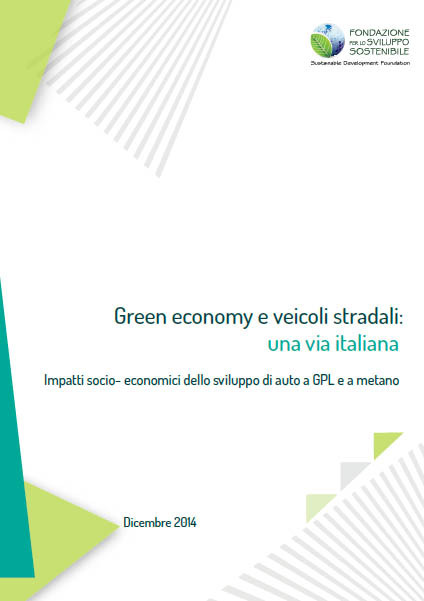 La mobilità sostenibile è un cardine strategico per la green economy: oggi i trasporti consumano il 28% dell’energia e sono responsabili di circa un quarto delle emissioni di CO2, soprattutto a causa del traffico su gomma e di circa 1 miliardo di autovetture private che circolano nel mondo, in continua crescita. Questa situazione insostenibile spinge a puntare, con forza e rapidità, verso innovazioni e nuove soluzioni. Come la nostra Fondazione ha recentemente documentato, più del 70% degli impatti negativi - ambientali e sociali - dei trasporti è prodotto da spostamenti brevi, urbani e periurbani. E’ soprattutto su questo campo, quindi, che bisogna vincere la battaglia della mobilità sostenibile. A fine 2013 la domanda di autoveicoli mondiale si è attestata a 85,7 milioni di autoveicoli venduti, con una crescita di circa il 4,7% rispetto al 2012 che aveva già registrato un 5% di incremento sul 2011. 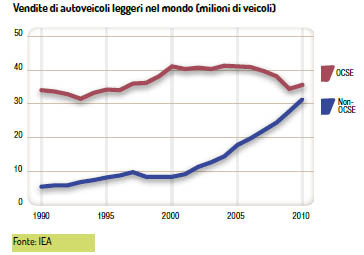 Le auto rappresentano il 75% del totale degli autoveicoli, con quasi 65 milioni di unità vendute (+4,7% sul 2012). Il mercato degli autoveicoli nel 2013 è stato sostenuto in particolare dalle vendite in Cina (+13,9%) e all’interno del Nafta (+7,1%). Il 25% dell’intero mercato mondiale di autoveicoli nel 2013 è rappresentato dalla domanda cinese, con l’intero continente asiatico che equivale al poco meno della metà (44%) della domanda globale. Il mercato degli autoveicoli leggeri è in forte crescita nei paesi non OCSE ed ormai sta raggiungendo per numero di vendite i valori registrati nei paesi OCSE. le vendite dei veicoli a gas metano e GPL crescono tra il 2010 ed il 2040, raddoppiando la propria quota di mercato (5%), per poi diminuire significativamente al 2050 tornando alla quota attuale (2%). Questa nostra ricerca analizza le potenzialità green dello sviluppo dei veicoli a combustibili gassosi in Italia. I risultati di questa ricerca documentano che le auto a gas sono una delle tecnologie ponte a basso impatto ambientale che, insieme ai veicoli elettrici e ibridi, possono contribuire, nei prossimi decenni, a ridurre l’inquinamento dell’aria nelle nostre città e possono favorire anche l’apertura di una prospettiva interessante per il futuro: l’utilizzo del biometano, prodotto dai rifiuti organici per l’autotrazione e di biopropano (bio-GPL). Green transport is one of the main sectors addressed in the green economy approach. 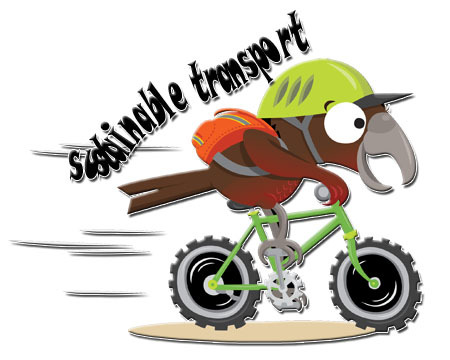 Transport is considered green when it supports environmental sustainability, protection of the global climate, ecosystems and their services, public health and natural resources. The goals of green transport are not only to reduce greenhouse gas emissions, air pollution, noise and space consumption, but also to reduce poverty and support economic growth. 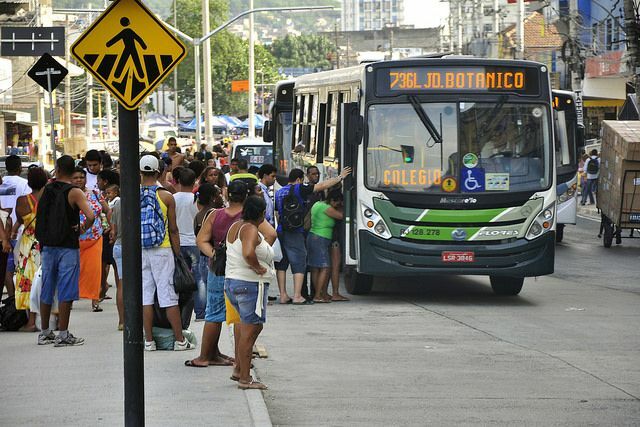 A critical issue is how to combine green transport with economic growth, mainly in developing countries. Usually economic growth and the rise of prosperity result in an increased volume of unsustainable private motorised transport: congestion and air pollution hinder the quality of living and the economic development and prosperity of cities. Extension of infrastructure for cars is expensive and space for unlimited growth is simply not available in most developing countries. Hence, sustainable transport modes have to be implemented and the right incentives to encourage their use must be created. Investments in the right transport modes can foster growth sustainably. Investments in public transport systems and non-motorised transport modes will improve the quality of living in cities and thereby increase its economic attractiveness. Economic analyses have shown that public transport access is the most important location factor for businesses. Another complex challenge is freight transport because it works as a trade facilitator and thereby fosters economic development but at the same time is a big polluter. To find a solution, again a holistic approach is recommended: changing production chains and optimising logics to avoid transport, shifting freight from road to rail or marine transport, as those have much lower emissions per t-km, and improving the operation and vehicles. This includes simple measures like tire pressure or roof spoilers but it could also include advanced options like diesel-electric hybrid engines. Apart from the effects of transport systems and operations, there is the challenge to green the production of vehicles. However, the question remains, whether vehicle manufacturing really should play the role of a key industry in economic growth policies. China is a good example for such an approach. As economic growth should not be hampered, it’s important to consider further options for green economic growth. A key driver for decision-makers is creating jobs. What is a green job in the transport sector? Jobs in manufacturing and operating of buses or subways (e.g. bus drivers), in extension of infrastructure for public transport, rail and non-motorised modes. In addition, there are green job opportunities in alternative fuels or engines. The definition of green transport jobs includes all those working in companies and organisations who are actively contributing to the vision of a green transport system: starting from the urban and transport planners that develop the vision and implementation strategy, local industry that, e.g. produces bikes, to operators and logistic companies that aim to increase the energy efficiency. La gestione della mobilità va affrontata in modo integrato, tenendo conto di tutti gli aspetti, non solo dell’inquinamento locale, che è poi quello meno complesso da affrontare con l’aiuto delle tecnologie. L’incremento dei gas di serra, prodotto diretto dell’inquinamento da traffico, è tenuto poco in considerazione ed invece è preoccupante; così come il rumore, un problema serio per milioni di persone che abitano lungo le strade delle grandi città e la questione della sicurezza stradale: una parte consistente dei morti e dei feriti per incidenti stradali avviene in città. C’è, poi, il tema della congestione, che resterebbe anche usando l’idrogeno o altre fonti ad emissioni zero; e quello della vivibilità delle città, che si sta perdendo: le città a misura d’auto espellono i cittadini dalle piazze, dalle strade, dai punti di incontro. Un approccio globale richiede una strategia coerente, mirata a gestire in maniera sostenibile la mobilità nel territorio urbano e metropolitano. Per attuare una strategia coerente, è utile individuare come punti centrali la gestione del traffico, il trasporto pubblico e quello non motorizzato, il trasporto merci in città, le misure di tariffazione, l’accessibilità e l’uso del territorio, l’influenza sui comportamenti in merito alla mobilità. Per stabilire una strategia di gestione della mobilità è necessario partire dai piani urbani del traffico, affrontando la questione del rapporto tra Regioni e Comuni: alle Regioni il compito di tracciare le direttrici generali, ma senza prescindere dai Comuni, che hanno un ruolo insostituibile nella gestione della mobilità, vivendo concretamente il problema: limitarsi alla gestione delle emergenze non è sufficiente, senza il coinvolgimento delle amministrazioni locali non è possibile affrontare la questione nella sua complessità. Risulta evidente la necessità di una strategia chiara: per esempio, è contraddittorio affermare di voler gestire la mobilità e poi non limitare l’uso dell’auto privata ormai giunto a livelli insostenibili. La limitazione dell’uso dell’auto privata è una scelta ineludibile: il mix di misure da prendere ruota attorno a questo obiettivo centrale. In primo luogo, occorre favorire la concorrenza del mezzo pubblico, mettendo in condizione di minor favore la circolazione delle auto. In secondo luogo, va affrontato il tema dei parcheggi: l’incremento dei parcheggi porta l’incremento del traffico in città. Va sviluppata, inoltre, una limitazione degli accessi delle auto, con zone chiuse al traffico in modo permanente e con altre zone chiuse in certi orari ed a certi mezzi. E’ importante che siano incrementate le linee di mobilità dedicate e protette per i mezzi collettivi, così da scoraggiare l’uso dell’auto privata. Queste misure darebbero certamente risultati importanti. Anche la sperimentazione delle domeniche ecologiche si poneva nell’ottica di influenzare i comportamenti ed abituare i cittadini a limitazioni dell’uso dell’auto che devono diventare permanenti ed ad un maggior ricorso al mezzo collettivo. Il punto rilevante è il trasporto pubblico ed il trasporto ciclopedonale non motorizzato (in bici ed a piedi). Va data priorità al trasporto pubblico, come punto qualificante di una strategia coerente, evitando errori del passato, come quello di eliminare i tram a vantaggio dell’auto. La priorità al trasporto pubblico si ottiene con le linee protette, la comodità dei mezzi, frequenze adeguate, informazioni e tariffe contenute (internalizzando i vantaggi del trasporto pubblico). Andrebbe, inoltre, promosso il road-pricing, la tariffazione degli ingressi i cui proventi vanno direttamente investiti nel trasporto pubblico, migliorando il servizio e riducendo i costi. E’ possibile limitare l’iniquità potenziale di una tariffa non proporzionale al reddito, che potrebbe sfavorire i ceti meno abbienti, attraverso un effettivo miglioramento del servizio e finanziando con i suoi proventi tariffe agevolate per i mezzi pubblici. Queste misure possono trovare un largo consenso tra i cittadini. Va fatta una scelta netta a favore della tariffazione della mobilità privata, andando oltre le incertezze che hanno caratterizzato questi ultimi anni. Va, inoltre, regolato, il trasporto merci in città, che incide fino al 20% sull’inquinamento e la congestione ed è destinato ad aumentare. E’ necessario arrivare ad una regolamentazione, con orari e modalità ben determinate ed organizzate. La consapevolezza degli impatti effettivi della mobilità è molto bassa: la gente è stufa del traffico, ma le conseguenze sanitarie dell’inquinamento sono poco conosciute o poco credute. In presenza di comportamenti più intelligenti e più consapevoli non sarebbe risolto il 100% del problema, ma una buona quota certamente. Occorre una buona campagna di informazione e la messa a punto di strumenti in grado di influenzare i comportamenti di mobilità dei cittadini. Influenzare i comportamenti di mobilità dovrebbe essere parte di una politica di mobilità, come sostiene anche l’UE. Una Amministrazione locale dovrebbe avere tra i suoi compiti quello di scoraggiare l’uso dell’auto, di favorire il trasporto pubblico, contribuendo a creare un sistema di mobilità maggiormente sostenibile. L’industria, a fronte di una domanda di mobilità più sostenibile e più intelligente, troverebbe il modo per fare affari anche con questa. Misure mirate per eliminare le auto più vecchie possono essere utili, a condizione che le nuove auto rispettino condizioni di elevate prestazioni ambientali. E’ chiaro che, da sola, tale misura non è risolutiva. Le tecnologie, dei carburanti e delle auto, non sono in grado di risolvere la congestione del traffico; ma anche le tecnologie hanno il loro impatto e non è possibile ignorarle. Le auto ibride, elettriche e ad idrogeno sono una prospettiva interessante nella prospettiva della prevalenza della produzione elettrica rinnovabile.